Well, this morning was the Westchester training ride. I was really looking forward to the ride before-hand as Laura had told me that it was really great to have ridden the course (she did the ride about 3 weeks ago). Also, all the Westchester info says that this is a ride, not a race, and no one will be left behind. So, this morning Drew and I woke up early to catch the train to Westchester. On the ride from the apartment to Grand Central, I almost got run over by an SUV (see #10). We were stopped at a light and an SUV had stopped at the corner. Drew said to me that I should watch out because the guy was backing up. I moved back a few feet, the guy backed up a few feet, and I thought that was that. Then I turned the other direction to look at the oncoming traffic. However, about 15 seconds later, Drew is yelling, "Stop!" because the guy is still backing up. For anyone who has ever stopped a light and kept one foot clipped in, I think you can understand that it's not the easiest thing to back-up still half clipped in, even though I was trying. Luckily, the guy either heard us or stopped in time because he missed me. I don't understand how he didn't see me the first time, but that's New York drivers for you. We bought our train tickets, boarded the train and were on our way. It was at about this point where I just started getting really nervous. I'm not sure that it was really the training ride that was making me nervous, I'm thinking that it's more the triathlon itself, but whatever the cause, all those nerves made my stomach pretty upset (see #7). So, we get off the train at the Rye stop along with about 20 other people. I had brought directions from the train station to the meeting point for the ride. I tried to figure out where we were, but one guy started biking and a group of us followed. After following him for a couple of minutes, he then said we weren't supposed to follow him. That didn't help. I got out my map and looked at it to see where we needed to go, but one of the other girls was asking a local, so we started following those directions instead. I'll admit we were a bit lost (see #1). Luckily, I happened to see a sign that was facing the opposite direction that indicated that we needed to turn left to get to Rye Playland (the meeting spot). So, we followed the sign and found our way to the meeting spot. We got there about 15-20 minutes early, so at least when we were lost, we had plenty of time to figure it out! The leaders started explaining the ride and how since there was such a big turn out (at least 100 people) we would be broken into four groups: Fast, Medium 1, Medium 2 and Social. I was a little bit torn about whether or not to go in the Medium or Social group, but in the end I decided that we should go in the second Medium group. I really wasn't too worried because there was supposed to be a leader at the front and at the back of each group, so even if I was going slower than everyone else, I figured there would still be someone at the back with me. So, we started out. Right away I realized that my cadence wasn't working on my bike computer (see #3). Everything else was working on the computer, so I figured I'd just go off feel. I wasn't too worried about that, even though it was a bummer. The ride started out fine. I was slower than a lot of people, which was no surprise. For about a minute I was feeling really discouraged, but then I reminded myself that this is supposed to be fun. That was all I needed. Then I decided that I would just enjoy the ride and the scenery - there are some amazing houses out there and it was fun just to look. What I didn't enjoy, however, were the roads. I realized when I was riding along that I'm really spoiled by riding in the park all the time. The road is 90% good in the park (I'm assuming mostly because the traffic there is pretty limited) and I'm not used to all the bumps and holes in a regular road. There are definitely a lot I'll have to keep my eyes out for on the actual race day. We had been riding for right around 8 miles and we went up a fairly long and slow hill. Laura had told me that there was a hill right around that mile, but she had made it sound a bit worse than I thought this hill was. We kept going for about another mile before the 10 or so people in our group stopped off. Turns out we had missed our turn about 2 miles before. We all turned around and headed back down the hill to continue on the right route. On the way down, Drew yelled out "Amy! My shoe fell off!" turns out what he actually said was "my chain fell off", but I did spend a good 30 seconds wondering how in the world he managed to have his shoe fall off (see #5). Drew and I stopped and he got his chain back on in record time. Of course, everyone who knew where we were going hadn't stopped, so our only choice was to pedal like mad and try and catch up. We had almost caught them to make our left turn, but of course we then had to wait for about 5 cars to pass before were able to turn. Needless to say, by the time we got to the next intersection, everyone was gone and we were left wondering whether or not to turn right or left. At this point we thought we had gotten lucky because three bikers came up behind us. Drew asked if they knew where to go, but it turned out that they were just out for a ride, they weren't part of the Westchester training ride. We were now officially lost (see #1). The three bikers turned right. I knew that was the direction we had come from and at that point the best we could hope for was to try to get back to somewhere we knew. So, we turned right too. Now, I'd like to touch on the subject of how I didn't bring directions or a map of the course with me. I'm not going to lie, I definitely thought about it, and it was fairly uncharacteristic of me to have not taken them with me. However, I think the real reason why I didn't was simply because I knew that there were supposed to be people with us at all times and that no one would be left behind. It just didn't even seem like a possibility to get lost. It's a mistake I won't be repeating. Part of the problem was also the traffic lights. Drew stopped at a red light to wait for me to catch up while everyone else rode on ahead. By that point, the group leaders were several minutes ahead of us, and we just never caught up. From that point, it was just the two of us out for a ride. Drew says that this was the point where he started having more fun since it never mattered to him where we rode our bikes. We definitely had a couple of good hills along our new route and I happened to see one off to the right, so we turned and went up and down that hill. I figure since I missed the dreaded Claire's climb, the least I could do was practice a few more hills. 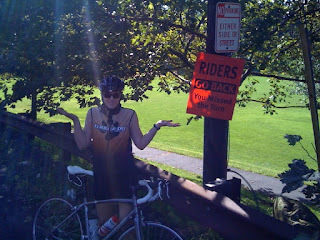 While we were out riding, Drew saw this sign, which says, "RIDERS GO BACK - You Missed The Turn". Seemed like a pretty good summary of the day! We asked a woman in a car where the nearest town was and she said Greenwich was about 3 miles down the road. We figured we'd ride there, figure out the train schedule, and go from there. We talked about getting a snack or the possibility of extending the ride, but it seemed like the best idea would be to just go and check things out. The trains only come once an hour on Sundays and it wouldn't have been fun to have just missed a train. We were able to find Greenwich and when we stopped to see the train schedule, we watched just a minute or two of a Soapbox Derby that was going on in town. I figured out that the next train was in 12 minutes, so it seemed like we should just go and get on the train. We hopped back on our bikes and rode the few blocks down to the train station. As soon as I got on my bike, I could tell that something was a little off. I looked at my back tire and sure enough, it was flat (see #8). Since we were now at the train station, the only option I really saw was to get on the train and worry about the flat when I got home. Our ride was 17.32 miles and we did that in 1:22:27 (12.6 MPH average). Not the 25 mile ride I was hoping for, but it ended up being quite an adventure and we managed to have 6 of the 10 things go wrong for us, 7 if you count the fact that we got lost twice. Here's a link to the route we took. And this is a link to the route we were supposed to take. The funny thing is that there are a couple points where if we had either kept going straight or turned left instead of right where we actually could have found the group. Oh well. So, this afternoon, I had been planning on going to the Terrier swim as sort-of a make-up for those extra 8 miles of biking that I lost out on. However, I ended up spending 2 hours at Toga having them give my bike a tune-up, look at the flat, and let me know what was wrong with my bike computer. Turns out that there was very little good news. The tire itself was fraying along the seam. I can only conclude that this was a result of the flat I got on August 1. At the time, I thought that the tube had been pinched in the tire and I was surprised that the tire didn't have any damage. I think that it probably did and that it just took a while to manifest itself. Turns out that although those Armadillo tires are strong, they're not strong enough to cope with that. At least it wasn't a puncture. Then I really would have been at my wits end! Because I had actually bought two new tires, but just hadn't gotten around to putting a new one on the front wheel, I was able to use a tire I had already bought instead of having to buy a new one, which was a nice bonus. The other bad news is about the bike computer. The reason the cadence isn't working is because there is a frayed wire. So, they have to order a new part for that in order to get it working again. At least it's not anything super serious and I can still ride my bike even though it's not working. All in all, today was quite the adventure. I'm just glad that we didn't get too lost and that we still managed to come home laughing about the whole experience. Believe me, I'm going to try to memorize every turn for the bike before the 27th!